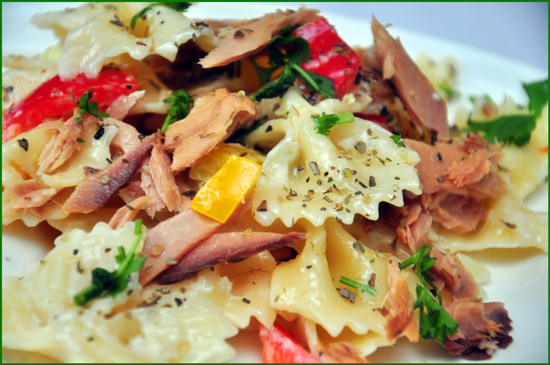 This Bow tie tuna salad is a very tasty addition to your sumptuous lunch or dinner. It can be enjoyed as a meal in a tiffin box too. It is a wonderful light meal & a refreshing chilled salad on a hot summer day. The bow tie shape is also very attractive to children & is great to serve at a child’s party. You may even serve it in canapés. In a sufficiently large bowl, combine cooked & cooled pasta, tuna flakes with oil, diced bell peppers, celery, lime juice, mixed dry herbs, salt & pepper. Give it a good stir. Just before serving toss well. Serve drizzled with olive oil, sprinkled with dry herbs & some freshly chopped coriander. Delicious dish! Thanks for sharing.